This is similar to my sermon for May 6, 2018. What does good fruit taste like? I can remember enjoying fruit when I was a kid. But somehow, along the way, I lost my desire to eat fresh fruit. I didn’t avoid it, it just wasn’t something that tasted especially good. It was easy to choose something else. What tasted better than nice, fresh fruit? Other sweet things. Candy…well, chocolate candy to be exact. Cakes. Cookies. Muffins. Ice Cream. And an ice-cold Diet Coke to wash it down. I was eating a lot of sugar (and fat). I was even eating sugar that I didn’t recognize…in my cereal, pasta sauce (when I was too busy or lazy to make my own), canned soups, breads, just about anything that was processed. Is it any surprise that I was obese? Like many I’d tried diet after diet. I’d lost weight and gained weight and continued the lose gain lose gain cycle for years…most of my adult life actually. At the same time, I knew that adult onset diabetes ran in my family (both sides) and that I was at high risk for contracting this lifestyle disease. But knowing something and doing something about it are two completely different things. In 2012 I decided to try once again to do something. This time I added running to the mix! I did lose weight…about 30 pounds…then 40 pounds…then it started to creep back up…then I lost a bit more and with great struggles maintained a 30-pound loss for a few years. Meanwhile I had gotten the running/racing bug and knew that I would improve if I lost more weight. Heck, I was still over 200 pounds. I needed to lose more weight! I also recognized that the way I was doing things wasn’t working. It was a major struggle to live on a restricted calorie diet and run at the same time. I decided to embark on an experiment. I knew that sugar was a potential problem for my health. So, I decided that I would quit eating sugar…refined sugar…sugar that was added into almost every processed for you could buy. Sugar. Sugar. Sugar. It is everywhere. Shopping is interesting when you’ve given up sugar. You see a container, think “that looks interesting,” read the label, and put it back. I had to start buying (and eating) unprocessed…real food. It didn’t take long for the pounds to start coming off…up to a loss of 80 pounds. It didn’t happen overnight but over a couple years. Eventually (April, 2015) I had my last Diet Coke and thus my last taste of artificial sweetener. My unexpected discovery was that once again fruit tasted wonderful. Without the masking effects of processed or fake sugar, the real sweetness of real fruit emerged. It’s like God’s wonderful gift of the best candy. As last week’s lesson continues, Jesus clearly identifies the fruit as love. “As the Father has loved me, so I have love you; abide in my love” (15:7). Live in my love and I promise that you will experience great joy. This love is so important to our well-being that Jesus commands us is to love one another. You will experience great joy in this. But why then is it so incredibly hard to love? Why is it so much easier to find fault with others? To find fault with ourselves? To focus on all that is wrong? Why is it so difficult to know that God loves us, not so that we can someday experience joy in the future, but so that we can experience God’s loving presence today? Distractions are like the added sugar. They seem important, they seem helpful, they lead us to what seems to be satisfying. They mask the essence of the real fruit which is God’s love for us. They make the love we are invited to share in the world taste bland…incomplete…boring even. So what distractions keep us from fully experiencing God’s love and thus not fully loving our neighbor in return? A specific way to follow Jesus? Worry…last week talked about the decline of our congregation. How is this a distraction? Anger…we have an over abundance of this today…often because of the exploitation of fear and worry…making others the recipients of our collective wrath. Frustration…little things and big things. Being impatient with ourselves and with others. Hunger…a need to fill an emptiness is way more than food. Many hunger for real community. The church is supposed to be the place to find and experience this community. Sadly we (the church) are not connecting with those who yearn for this. So that the church is dying while others are dying because they don’t have what we are supposed to offer. I wish I knew how to fix this. But I do know the answer is found in loving one another. First, our understanding that God loves us and has chosen us. And without these things our joy can never be complete. That fruit almost never tastes as rich and sweet and awesome as it really is. Almost never…because we always get glimpses. Just think of that last time you experienced great joy. What was happening? Who was there? Sometimes it’s an experience of someone else’s joy that moves us…like joy is contagious. These distractions don’t have to have the final say. That’s what Jesus is telling his disciples, what he is telling us. To live in him is to live intentionally. To cultivate practices that help us to get past those things that distract us. Practices like prayer…maybe disconnecting from the noise will help us to see one another as worthy of love. Practices like caring for others. It’s amazing how we can see our own situations differently when we quit thinking solely about ourselves. And above all loving one another…loving one another in our community and outside of it, is where we get to taste that wonderfully sweet fruit…and experience the joy of Jesus in and among us. It’s not always easy, heck it’s almost never easy, but it is oh so worth the effort. That fruit of love is the greatest. I’ve been a bit out of sorts the past few days. I’m not sure why, but suspect it’s not due to any ONE thing. This is part of it: Politics bleh. I know that I should quit paying attention to the news because every time it seems as if we’ve hit bottom, it turns out we can go lower still. I fear the normalization of disrespectful and uncouth behavior. We had an incident at our Vacation Bible School, where one child called another “stupid” and things escalated from there. In talking to our youth director about it I wondered how we are to teach our young ones to respect one another when our national leader models disrespect. We must resist by modeling the command of Jesus to love one another. And this: On a slightly related note, I continue struggling to understand how the majority of white Christians supported this person for president. And how can they continue to support someone who models the complete opposite of the teachings of Jesus. Many of my pastor friends, and many members of my church do oppose this ugliness. But I wonder if we are a minority among Christians, and if so, the church has completely lost its way. I struggle with this every day…and wish I didn’t have to. And this: I’m tired this week…sleepy tired, heavy legs tired, wanting to eat tired. Thankfully it’s Friday…a day off. I won’t be resting much as I’m going to start moving stuff from the garage to the POD (see Sometimes You’ve Gotta…). But still I’ll take a nice nap later, a nice bubble bath, and go with my daughter to get my first (and probably only) tattoo. Today I’m personally thankful for: the gift of gratitude and the spiritual benefits of being grateful, even and especially when out of sorts; for the ability to exercise away frustrations- more spiritual benefits here; and for all those who are working very hard to save our country because it is worth saving. 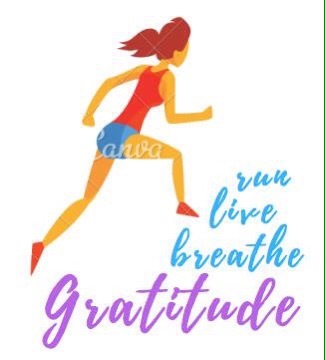 My tattoo will sort of look like this, but with a silhouette running figure and better font for the words: gratitude, breathe, live, run. The particular typo was one in which I had replaced the word, “united” with the word, “untied.” Nothing like putting in the opposite! But then I thought about it… and one of the messages of my sermon was that Black Lives Matter and I realized that we’ll never be united until we are untied. Untied from our fear of our neighbor… especially those who are different (race, religion, language, and nationality). Untied from our apathy… If I believe that my life is just fine, thus I don’t need to care for my neighbor then I am deceiving myself and not really living. Untied from our fear of what others may think… some try to say that being an ally of Black Lives Matter means being an enemy of the police. This is absurd and we all benefit from better police training. Let’s not allow the loud voices defending the status quo silence us. As long as we are bound by fear and apathy we will never experience the life giving, life enhancing unity that is before us. It is only when we are untied that we are free to truly see our brothers and sisters are beloved, as created in God’s image, and a true brother or sister. I don’t think we can experience unity, or be united, until we are untied. What else do we need to be untied from? This week I ran 25.5 miles, and except for the week of the Carlsbad Marathon, this was the most mileage for 2017. Taper and recovery account for all the other low mileage weeks. This 25.5 marks the first week of training for Mountains 2 Beach on May 28, only 15 weeks away. Yikes! Up up up and down down down is pretty fun! Then the run down was glorious! It was at a perceived easy pace that was at or better than my goal marathon pace. As the next marathon is down the very same trail I’m thinking that I just need to get my legs used to that downhill for a much longer time and then I will have my BQ! My heart rate only went above 150 near the top of the climb and then when I was having a fun fast finish. The best part of this week and today’s run is that in every other training re-start after marathon recovery (I’ve run 5 now) that first long run has made me ask myself while running, “how did I ever make it through a marathon?” This didn’t happen today and hopefully with won’t happen next week either! So, today I am personally thankful for: a good start to training for marathon 6; for the beautiful sound of rushing water as I ran along a stream that was actually filled with water (a rarity here in SoCal); and for the mental and spiritual health benefits of endurance sports (especially in these trying times). What does it mean to have the light of life? I would guess some of us have differing interpretations. For me, it is experienced in speaking, writing, doing…living… with integrity. It is also in bravely advocating for, and walking alongside, those who are different from me because this is how my faith instructs me to love God and love neighbor. These days seem dark and many are feeling hopeless. I understand this, as I vacillate between feelings of despair and the sure and certain conviction the Jesus is here alongside, saying, “you go, girl!” One piece of advice that I will be giving often is the importance of self-care. Please remember that you cannot adequately help others when you are not operating from a place of health (more on this later). Today I am personally thankful for: my running coach who likes to have good discussions and who challenges me on my assumptions (and for his training me! ); all the pastors I know who are living their own calls with integrity and who feel the struggle; a good early morning workout. Before we can let our light shine before others we need to recognize that the light we possess is a gift of God’s grace. Jesus said, “you are the light of the world.” He said this to the community…you all. With this proclamation, you are light, I am light, we are light. This is good news! We have the opportunity to recognize that light that exists in our neighbor. Then as we walk together our cumulative light shines ever more brightly on a weary world. I experienced this when I joined the Justice for All March, as well as the demonstration on behalf of our Muslim neighbors as LAX. Some might believe that these marches and demonstrations are a waste of time, that they don’t really change anything. I believe that they do much! They energize those who gather together…they remind each of us that we are not in the struggle alone…they let the vulnerable know that they are not alone. Of course more needs to be done…and will. My call as pastor reminds me that my role is the public proclamation of the Gospel…the good news of Jesus the Christ. This good news is that through Jesus we are loved…and we are all called to love God and to love our neighbor in return. Happy Tuesday! Today I am personally thankful for: the reminders of God’s love and grace that I receive, especially when I am feeling down; the members of Our Redeemer who gathered last night to work on our upcoming Silent Auction Fundraiser; the opportunity to run 5 miles this afternoon. February already! January was a difficult month for many. As I think about this I know that even in the midst of difficulty we can find joy…in a family member, in a friend, in creation, in the often silly things that happen in a day, in art, in song, in exercise, and in relaxing. Where do you find your joy? Let’s all find ways to take care of ourselves. Today I am personally thankful for: the mental health benefits of running; that my post marathon recovery time is coming to an end so I can soon put in some long runs; and the laughter of children.